CROCKETT – In a pre-Thanksgiving basketball game, the Crockett Lady Bulldogs welcomed the Coldspring-Oakhurst Lady Trojans to the Andrew J. Hopkins Activity Center for an early Tuesday afternoon contest on Nov. 20. The game was nip-and-tuck during the first half, but after halftime, the Lady Trojans began to pull away as they won the contest by a final score of 59-36. The first quarter was fairly even as the Lady Bulldogs dropped in 11 while Coldspring netted 13. 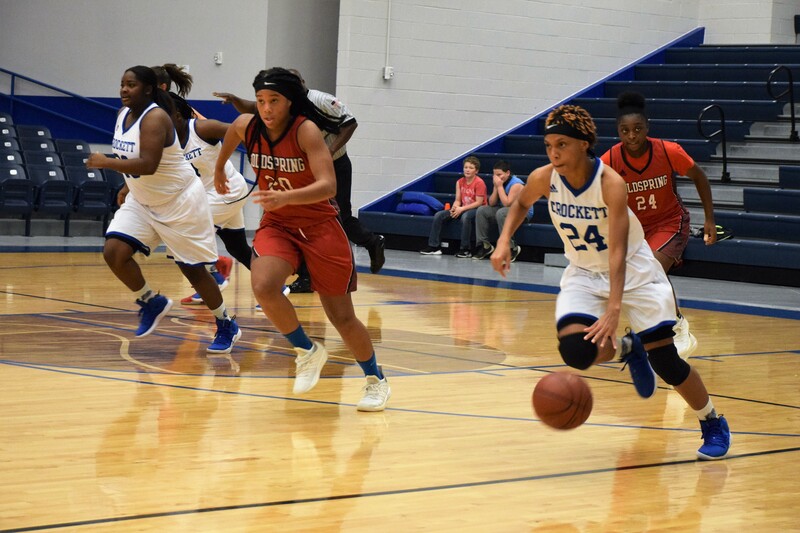 Tynaisha McKnight paced Crockett with six while Katelin Holmes had three and Shabess Johnson chipped in two. The Lady Trojans first quarter points came from Jade Eldridge with eight, Bre’Azya Bookman with a three-pointer and Petra Kasho with two. The second quarter was more of the same for Crockett as the Lady Bulldogs scored another 11 points in the period. T. McKnight had four, Holmes singed the twine with a three and both Holmes as well as Alinjah McKnight had two. Coldspring pushed their lead to eight by the time the halftime buzzer sounded and led 32-22 at the break. Eldridge added six more to her total and Destiny Thompson scored five. Bookman added four and Jakayla Glaze – along with Christina Harris – had two. Following the break, the Crockett defense played much better but unfortunately, the Lady Bulldogs offense did not. A. McKnight had four, Holmes hit a pair of free throws and T. McKnight made one of two from the line. Eldridge continued to pace Coldspring and went for five points in the third quarter. Glaze had four while both Bookman and Kasho had two apiece to make the score 45-29 after three periods of play. 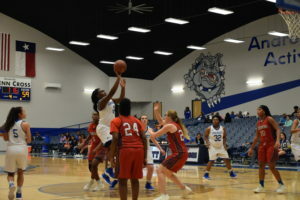 The Lady Bulldogs tried to make a spectacular comeback in the fourth quarter, but try as they might, the Lady Trojans had opened too big of a lead to surmount. Holmes had five and A. McKnight had two to close out the Crockett scoring. Coldspring continued to expand their lead as the final period of play started. Three Lady Trojans – Eldridge, Harris and Thompson – all had four, while Glaze had two as Coldspring defeated the Lady Bulldogs by a final score of 59-36. On the game, Crockett was led in scoring by Katelin Holmes with 13 and Tynaisha McKnight with 11. Alinjah McKnight went for eight and Shabess Johnson added four. The Lady Trojans were led in scoring by Jade Eldridge with a game-high 23. Bre’Azya Bookman and Destiny Thompson both dropped in nine while Jakayla Glaze had eight. Christina Harris scored six and Petra Kasho closed out the Coldspring point production with four.